More than 600 million people lack clean drinking water. Drought affects more than 35 million every year. And by 2050, 1.3 billion people will live in flood-prone areas. Most people think that building dams, water treatment plants and other infrastructure is the only solution for these problems—but that’s only because they haven’t considered the many benefits of green infrastructure. Green infrastructure like healthy forests, wetlands and coral reefs can cheaply and effectively enhance the performance of traditional built, or “gray infrastructure.” For example, green roofs can capture rainwater, reducing flooding and stress on sewage systems; mangrove forests can complement sea walls by reducing storm surge. Yet, green-gray projects remain relatively niche mainly because of persistent myths about their feasibility. 1) MYTH: Infrastructure is made of concrete and steel. 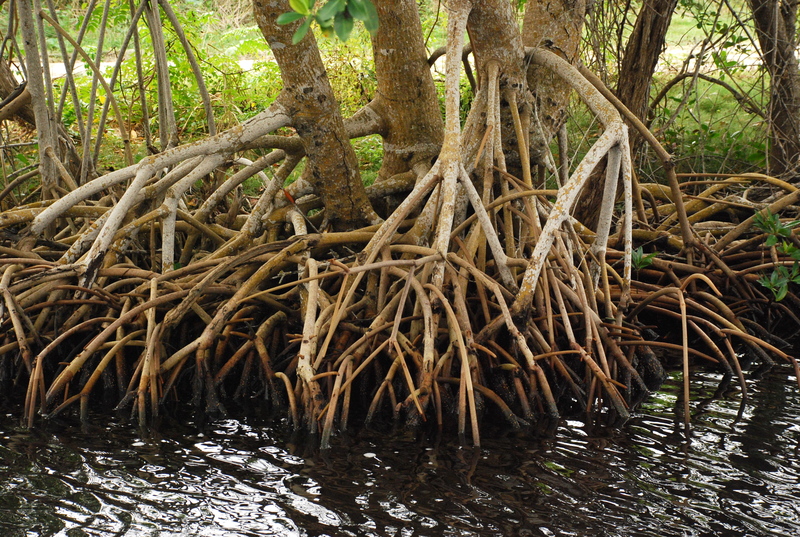 Natural systems such as forests, floodplains, soils and wetlands can contribute to clean, reliable water supply, protect against droughts and floods, and enhance agricultural productivity. 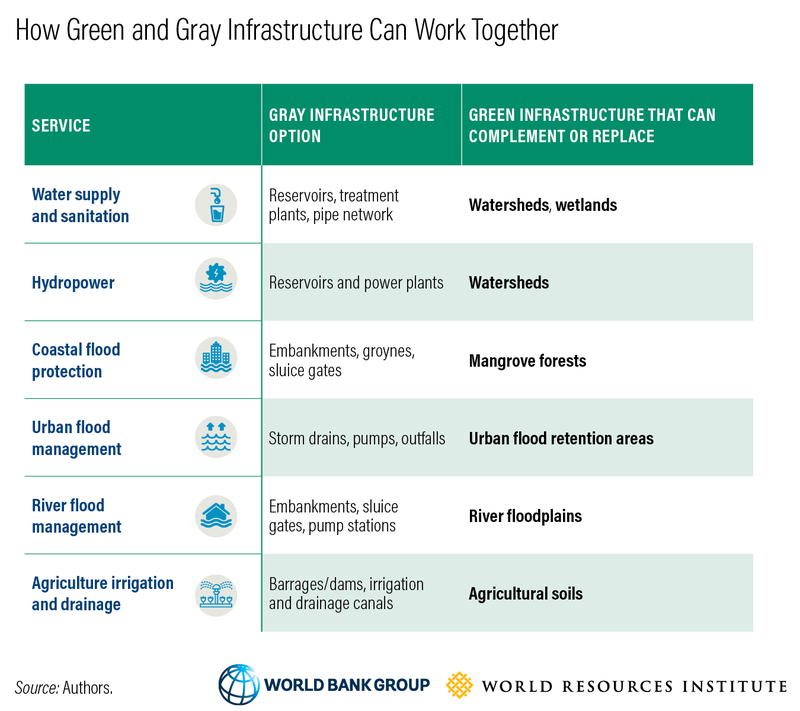 Green and gray infrastructure can be used in tandem to enhance overall system performance and climate resilience, oftentimes at a lower cost. Some governments have moved beyond thinking of infrastructure as only construction projects. Peru now has a law requiring water utilities to earmark a portion of their revenues for reinvestment in green infrastructure like reforestation and sustainable agriculture projects upstream of water treatment plans. California classifies watersheds as infrastructure components. China’s National Program on Sponge Cities aims to reduce stormwater flooding and reuse rainwater by covering 80 percent of urban areas in materials that can capture water, such as green roofs and permeable pavements. 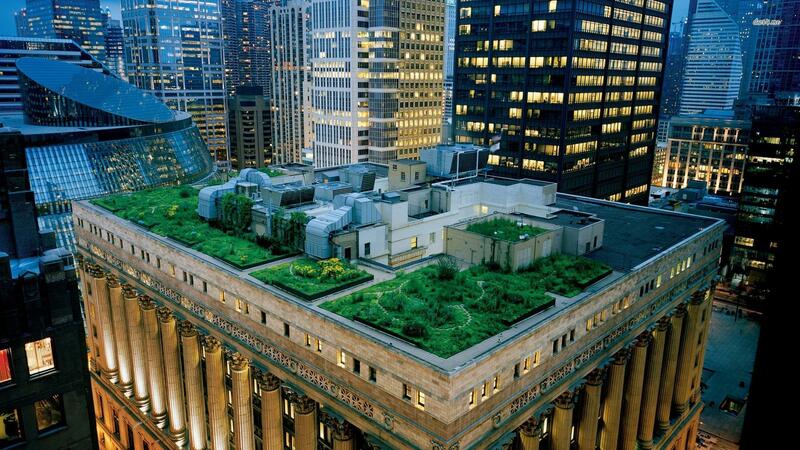 2) MYTH: Green infrastructure only offers environmental benefits. While green infrastructure’s environmental benefits are hard to miss, we sometimes overlook these projects’ technical, social and economic benefits that make them uniquely advantageous. Green infrastructure can be paired with gray systems to provide lower-cost services. For example, restoring degraded forests can be cheaper than upgrading a conventional water treatment plant, while boosting water quality in the same way. Forests naturally capture sediment, which improves water quality. Removing sediment from water is often a water treatment plant’s costliest task. Conserving water through green infrastructure shows how natural solutions can boost local economies. The China Water Conservation Project increased farmer income by as much as 200 percent and raised groundwater levels in the country’s arid northern plains by using sustainable farming techniques as green infrastructure. The World Bank calculated the economic rate of return for these measures to be 19-24 percent. Both green and gray infrastructure projects can raise tough decisions for local communities about their land use, livelihoods and way of life. However, if designed well, green infrastructure can bring social co-benefits, preventing some of the NIMBY-ism so prevalent with new construction. Green infrastructure projects are unique in that communities often take some ownership of them, tending to their long-term operation and maintenance. For example, the Watershed Organization Trust (WOTR) engaged communities in Maharashtra, India to bring water back to the Kumbharwadi watershed. They helped community members implement solutions such as reforesting degraded areas and terracing land to slow and store water runoff. The project helped increase net agricultural incomes 10-fold, replenish groundwater and increase the value of farms. The project’s success can be attributed to how it put equitable decision making and community ownership at the heart of its green infrastructure initiatives. Twenty years in, WOTR’s projects in Maharashtra are still going strong. The cement industry is the source of about 8 percent of global carbon emissions, making traditional infrastructure construction a highly carbon-intensive process. Green infrastructure, on the other hand, is a potentially huge carbon sink. Stopping deforestation and restoring forests could remove as much carbon dioxide each year as removing 1.5 billion cars from the roads. It is a main reason that more than 100 countries have committed as part of their national climate plans to protect or restore ecosystems. Green infrastructure can also boost climate resilience since it is flexible, reversible and can adapt to changing conditions in ways that built systems cannot. For example, a flood control levee can break when storms get too strong; a well-managed flood plain is generally unaffected by extreme weather. At the same time, green infrastructure is also vulnerable to climate change, and threats of species shifts, wildfire and sea level rise take their toll on the natural world. Protecting these systems and tackling climate change will preserve the benefits they can provide. 5) MYTH: Infrastructure is expensive and difficult to finance. Every year from now until 2030, the world will need to invest an estimated $171-229 billion on water supply and sanitation, $23-335 billion on flood protection, and $43-100 billion on irrigation to meet the Sustainable Development Goals. Using only gray systems would result in numbers at the higher end of these spectrums. Exploring natural solutions can reduce the costs needed to fill service gaps. Financing an infrastructure project can often be the hardest step in getting it off the ground, but green projects can bring new funders to the table. Green infrastructure can be designed to produce environmental and social co-benefits that enhance their overall economic viability and make them particularly attractive to mission-driven funders. For example, last year the Forest Resilience Bond in California attracted $4.6 million in private capital for a forest restoration project by marketing the project’s fire risk reduction and water supply benefits for water utilities and residential areas. The next generation of infrastructure must be attuned to the realities of the 21st century and make use of all the best available strategies. That is why it’s critical for decision-makers to systematically consider the role of natural systems and, where appropriate, integrate green and gray infrastructure. The new report provides guidance, approaches and examples on how to integrate green infrastructure into planning and investments in a way that meets infrastructure needs, reduces costs and benefits local communities. While incorporating green infrastructure will not make sense in every project, it’s important to rely on facts rather than myths in making water-management and development decisions.